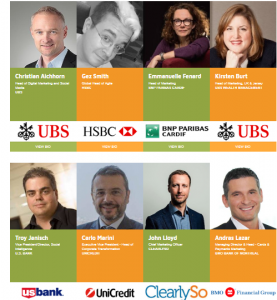 The conference is one of the Digital Marketing For Financial services summit 2018 series of digital marketing & Financial events around the worldwide, such as its conference in New York on 13 – 14 November 2018. Digital marketing for financial services summit 2018 is Extremely relevant and provided a good level of detail that will allow us to take back learning to our business. It’s considered to be the largest gathering of financial marketers in Europe. It’s a 2-day event of sessions, workshops, and exhibitors, that will take place from 20 – 21 September 2018 in London, UK. Build trust and differentiate your brand as the largest digital marketing forum for financial services in Europe. Hone your digital capabilities to deliver next-generation experiences. Combine sound strategy with tactical implementation. Bring theory into practice – build engagement, optimize performance, and raise profits. And more big branded banks. updates here OR discover more Digital Marketing events, conferences & webinars in the UK here.